Canvas Tents for Sale, Standard functioning and practical tent for rapid deployment in Emergency field hospital, Health centre, Epidemic Treatment Center, Storage, Logistical centre, etc. Multiple attachments of these tents can be done seamlessly to form a much larger working area as per need. This type of tent is specially designed for its resistance to wind, rain, UV and microorganisms. The polyester or cotton canvas combines strength, durability, waterproof, and breathing capacities. Canvas Tents for Sale are designed for situations where performance, weight and pack size are critical. Features and space have been pared down to the minimum required to maintain the comfort and safety required for Military Tents, Disaster Tents, Army Tents, Relief Tents, Shelter Tents, Medical Tents, Emergency Tents, Camping Tents, Refugee Tents, Warrior Tents and more. Groups from three to six people will find the living quarters in this range of tents to be spacious and pleasant, with generous headroom. These are perfect for families with older children or groups of friends and offer a comfortable base at an attractive price for outdoor adventures and holidays. It comes in size as 5m x 5m, 5m x 10m. We also do customize tent at the request of the clients. 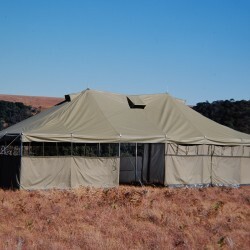 We supply Canvas Tents in South Africa. Canvas Tents for Sale in South Africa, this tent is light and durable and ideal to be used as temporary accommodation for families left homeless in disaster situations. Our tents are designed and manufactured with the best mechanical technology in the market which ensures a quality and improved Canvas Tents. Our business was created in order to provide cheap and long lasting quality tents as you request at the soonest. Our team has experience for almost 2 decades which allows us to advise you and meet any emergency situation you are faced with. We make use of excellent quality fabric and is even waterproof. These canvas tents are available is sand beige and army green. Tents for Sale are the biggest Canvas Shelter Tents sellers and suppliers worldwide. Tents for Sale make canvas tents with the given advantages such as, Heavy duty finishes of the tents that make this ideal for accommodation as well as storage applications. Economical in terms of usage. Made from superior grade cotton canvas in the waterproof finish. Owing to our proficiency in this domain, we are engaged in offering our clients a wide range of Canvas Tent at a cost-effective price. 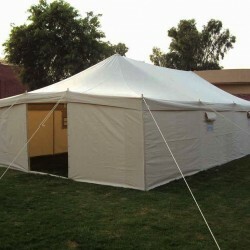 Being a quality-oriented organization, we assure our clients that this tent is best in quality. 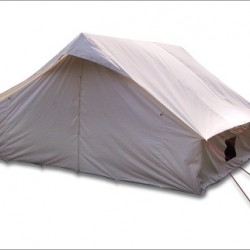 Our skilled professionals only utilize fine quality raw material, while manufacturing the entire range of tent. Moreover, our offered tent can be availed in a wide range of sizes and shapes, as per the requirements of our esteemed clients. Canvas tents are made up of ripstop canvas and comes in an olive green colour. Canvas tents are used as military tents, temporary barracks, shelter tents, refugee tents, emergency tents or and can also be used for camping tents. All our tents can be easily branded and can be made to your specification and are 100% waterproof. Armies all over the world have used canvas tents for a variety of uses as they are quick to set up and take down. 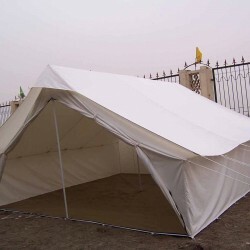 We provide canvas tents to countries all over the world and they have strict rules around tent specifications which we meet and deliver accordingly. Our tents are considered and manufactured with the most technically superior equipment in the business. We keep a close eye on the evolving manufacturing industry, and as it grows we go through development and entire machinery updates. We do this to guarantee client agreement and to keep up with the demand for our highly required after products.